Exile (cert. 15) will be released as a two-disc DVD (£19.99) by FremantleMedia Enterprises on 13th June 2011. 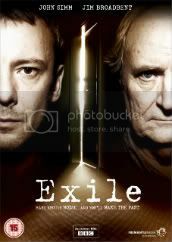 Exile, new BBC drama starring John Simm (Life on Mars, State of Play), Olivia Colman (Peep Show, Green Wing), Jim Broadbent (Moulin Rouge, Iris) and Clare Goose (The Bill, Waking the Dead) is on UK DVD from Monday. Looking forward to getting my DVD and to watching this again! I have to admit, I probably wouldn’t have watched this except that John Simm was in it, and I’ve never yet been dissapointed in anything I’ve seen him in – he’s like a kite-mark for quality drama, isn’t he? And Jim Broadbent, Claire Goose, Olivia Coleman and Shaun Dooley as well – what’s not to like, really? They are all such good actors. I know it’s probably a forlorn hope, because the story’s been told now, but I think you could make a second series – maybe dealing with the aftermath. By the time we got to the end, I for one wanted to know how they’d get on once the dust settled – I’d come to care about the characters, enough to want to see more! Anyway, thanks for all the clips and images – the quality of the latter in particular is fantastic! Sign up for the Cult Labs Weekly Newsletter!